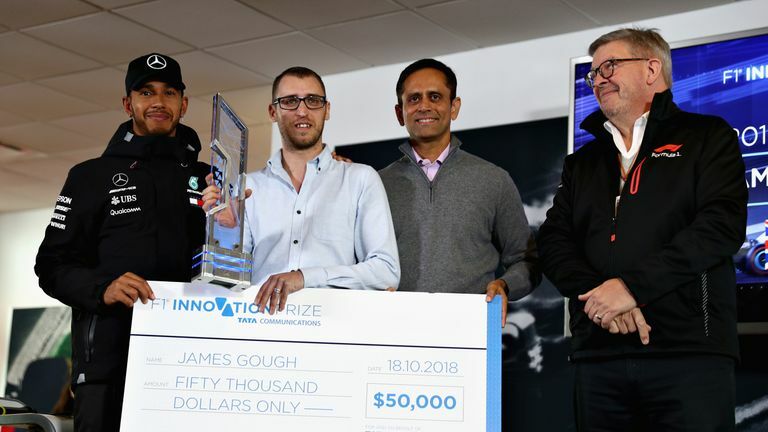 Mercedes' Lewis Hamilton helped judge this year's F1 Innovation prize which was won by Brit James Gough who picks up a $50,000 prize for his F1 data app idea. Gough was crowned F1 Innovation Prize Winner at a ceremony held ahead of the United States GP in Austin, Texas. "It's really great what Tata does," said Hamilton. "Putting the sport in the fans' hands to come up with creative ideas about how they want to see the sport." Gough's winning idea was a Smart Visual Assistant (VSA) that can deliver personalized, contextual data to the fans with voice text and gesture commands. "Through my app, I want other fans to get a glimpse of being on the inside of a sport they love. I hope that my idea will help give fans access to all the data they want, and that they're able to use the data to not only see what's happening but to understand why it happened. It should lead to more people getting involved in the sport," said James. The award also carries a prize of $50,000 prize. F1 boss Ross Brawn: "We want to break down the barriers of language and technical know-how so that more people around the world are able to immerse themselves in the greatest sporting spectacle on earth. Through new features like the Halo graphics and live events like our F1 Festival series, we're continually looking for ways to bring more fans closer to the sport. That's exactly what James' winning idea seeks to do too in a truly innovative way." F1 world champion Lewis Hamilton: "This is such an exciting time for the sport, with more and more ways for people around the world to get close to the world of F1 - through social media, online, and of course the F1 Innovation Prize. There's so much happening at any given second during a race. James' idea was my favourite because it lets both die-hard fans and those who might be new to the sport make sense of it all and really immerse themselves in the action." F1 Innovation Prize Winner James Gough: "I've been a huge fan of F1 since I was a teenager, but never in a million years did I think that one day I'd get the chance to be part of the F1 circus - that's why winning means so much to me. Through my app, I want other fans to get a glimpse of being on the inside of the sport they love. I hope that my idea will help give fans access to all the data they want, and that they're able to use the data to not only see what's happening but to understand why it happened." Managing Director of Tata Communications' F1 business Mehul Kapadia: "During the last five years, this competition has shown us how much untapped potential there is in the global community of F1 fans, and now we're taking this initiative one step further by turning the winning idea from concept to reality," said, Managing Director of Tata Communications' F1 business and the company's Global Head of Marketing. "From bringing half a billion fans worldwide the Grand Prix action each season to testing in action cutting-edge technologies like UHD video and virtual reality - we're excited to be part of the digital transformation of this great sport."